What is the 1st most dominant subject in the New Testament ? It is SALVATION. And what is the 2nd most dominant subject in the New Testament and the Old Testament combined? It is the Final Answer to the 1st most dominant subject. It is the SECOND COMING OF JESUS. Belief in the 2nd Coming of Jesus is not popular with Christians Today. Very few Seminaries today teach it, or believe it. Therefore many pastors do not teach it or believe it. This REAL EVENT IS VERY IMPORTANT to GOD; and should also be very important to You. There are many Titles of Christ in the Bible. At the top of that list is “The WORD”. That’s right, JESUS is the very WORD of GOD. So I ask you CHRISTIAN WHY do you not believe the WORD of GOD ? Here are some Facts and Scriptures for you to consider. If in Fact you take the time to READ HIS WORD. References of Jesus 2nd Coming out weight references to His 1st Coming by a factor of 8 to 1. CHRISTIAN I ask you again Why do you not Believe Jesus is Coming Again? Why do you Believe the words of men and IGNORE the WORD OF GOD ? The GREATEST DAY in all of HIS-STORY is almost upon us. The Cross is Empty, The Tomb is Empty. JESUS is RISEN, HE IS ALIVE. The Greatest War & Holocaust of Humanity is coming ! The Final Chapter to the long and Tragic Story of Mankind is called “THE RETURN OF THE KING”. The VICTOR is KING JESUS and those that Belong to HIM. Whose side are you really on? Are you a WINNER or are you a LOSER ? The following are some Scriptures you would be VERY WISE to read for yourself. Unless you understand the TRUTH you Will fall captive to the Lies of the Coming ANTI-CHRIST, the FALSE MESSIAH who will be in Hell with all the other Losers! How can you and I as believers in Christ remain true to our individual calling by God to be His Salt and Light in the darkness of the culture we live in? 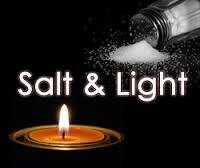 To begin we need to define both Salt and Light. Salt is a preservative. As long as salt remains pure and does not get mixed with another substance it will keep its properties and continue to be effective. Salt also provides flavor. The Gospel represents a meal that when flavored with truth, and given to a true “Seeker of God” will satisfy their appetite forever. Salt also makes us thirsty and so we drink water to refresh ourselves. But water is only a temporary solution for our thirst as we begin to thirst over and over again but never get satisfied. The Gospel however is the Living Water that satisfies our body, mind and soul eternally and will satisfy our everlasting thirst. Light is meant to illuminate. Just as darkness flees from the light, so to the Gospel, the light of Truth; causes the lies that live in the shadows that plague mankind’s soul to disappear. Light illuminates the path before you, so you can see the destination of your journey clearly. The Gospel represents a journey that everyone needs to take in order to gain the Salvation offered by God. The Word of God is a “Lamp unto thy feet”. It keeps you from stumbling on the pathway home. God if you recall never prepared Hell as a destination for mankind. Hell is the place prepared for “the devil and his (fallen) angels” in which fallen humanity will also reside. It is mankind’s destination by choice. It is not Gods choice for mankind. The Apostle Paul in the Book of Acts spoke about “becoming like one of them” in order to witness to the pagan world around him. He did not mean to blend into the society, to be like one of them, to do what they do; so he could have an opportunity to witness to them. If Paul acted like them he would not have stood out from among them. “Becoming like one of them”, means to understand what they believe and why they believe it so you can witness to them intelligently and show them the errors of their belief system, the flaws contained within their worldview. Rather than engage people in meaningless witnessing on topics of their choosing, which lead people away from the Truth into arguments, and animosity. Paul chose to control his witnessing by preaching Christ Crucified and His Resurrection from the dead. The ultimate objective of your witnessing is to take people to the Savior’s Cross and to His Resurrection from the dead. People must understand their need to be saved. Your job is to explain both why they are in need of a Savior and what it is that they are being saved from. This way they will understand the truth of their situation before a Holy God who is coming this time in wrath and with judgment. Without repentance there can be no Salvation. When Paul spoke to someone with biblical knowledge, he spoke to them using the Bible to show them the God of the Bible. When they had no knowledge of the Scriptures Paul spoke to them about Creation and the God of Creation revealed in the Scriptures. These are the two areas of common ground we have with people to explain who God is. I realize we are all afraid to take on “Spiritual encounters with darkness”…which is the essence of witnessing. However we need to realize as believers we have the resident Holy Spirit, the Comforter within us so we can step out in faith knowing we are not alone in our witness. Even Moses feared to do this. But God reminded Moses that it was God who made his mouth and it would be God who would put the words into his mouth. Because Moses doubted, God gave the honor of speaking HIS words to his brother Aaron, who then spoke for Moses to Pharaoh. Moses lost part of the Joy that belongs to each of us in our journey because he chose not to listen and obey God. God is strong when I am weak. This insures that He Gets the GLORY…not me. My ears have heard responses from my lips in witnessing confrontations that came from the Holy Spirit, not from me. How awesome it is to see God use our weakness while watching HIS strength in action. All of us can look back on our journey to faith in Christ and see the multiple seeds that were planted by people into our lives. You and I are not responsible for any one persons Salvation. We are not responsible for that person’s choice to either accept or deny the Gospel. In the end the responsibility rests with the Holy Spirit and with the choice each person must ultimately make. You and I are responsible to obey God and do His will during our lives. Being obedient is how we prove to God that we really love Him. One of the saddest stories in the Bible is about Samson. God was with Samson from the womb. He was a believer that was used greatly by God until he became like the culture around him. The process was slow, like a frog being cooked alive in a pot till it dies. God did not turn away from Samson; it was Samson who turned away from God to live a perverted life. You know the story, Delilah cut his hair. Samson got up to fight but his strength was no longer with him. The saddest part is that Samson did not know that the Holy Spirit had departed from him. He no longer was salt and light in his culture. God left Samson to the consequences of his own choices for the rest of his life. In a sense he was given over to satan for a time. Yet God in His mercy to Samson allowed him to end his life in the service of His Lord. Every face of someone you know represents the face of God. They were made in the image of God. If they do not know Jesus as Savior, their image is damaged. They need to hear your personal God story; they need the seeds that God has uniquely given you to plant. They need you to be salt and light for their sake. This is a time when the pulpits of most churches are filled by weak men in weak churches giving weak messages. Instead this should be the time for boldness, for strong biblical ministry so people hear the word of the Living Lord and respond in true repentance for their sins. One of the signs of the wrath of God is when he abandons a culture. I believe He has done that throughout the world, including the United States. Our culture has asked God to leave and He has complied. We now are left to reap the whirlwind. There is one last aspect of Salt we did not touch on, the ability of Salt to heal. As a believer, knowing who I am in Christ is a great responsibility. When I act like Moses and refuse to open my mouth or when I act like Samson and choose to flow with the current of the sewage we all swim in rather than Stand Alone against the tide… my heart breaks leaving an open wound. You see, my soul is full of light. I know better than to let the encroaching shadows of the old man get a hold of me…yet…often shadows fill my soul. Sometimes even a follower can get lost. When this happens my witness is tarnished, the Holy Spirits power is diminished in my life and I am ashamed and cry out for forgiveness. The salt that I am supposed to be turns inward and flows into the open wound in my broken heart. The salt then causes me pain as it heals me. The God I serve knows that ”I am but dust “ before HIM. My God loves me and extends new mercies everyday to all those who love him. He heals my broken heart and takes away the evil shadows in my Soul with His light. And then, I begin a new day devoted to making a difference for Him with those I love and those He puts into my path. May you continue to live your days under the protection of His wings, bathed in His light and covered by the Shadow of His Cross. Occasionally people have messaged me saying that what I am writing is too harsh, and that I should focus on the LOVE of JESUS. That by focusing on the JUDGMENT OF JESUS, I am making it harder to share the Gospel. You have it backwards.To know GOD is to FEAR GOD. That is step one for understanding you are a SINNER in need of Salvation. There is NO TRUE SALVATION if you did not REPENT. You cannot REPENT unless you FEAR JESUS first. Two years ago I was on an operating table in the hospital. The doctors finished my heart cath and then told me I had 2- 80% blockages and that they were going to either split me open or attempt to insert stents. I had no idea how sick I was when I entered the hospital. God in His Mercy and Grace gave me more time to be here to serve HIM by planting seeds and encouraging the faith of believers and confronting non believers in LOVE with the TRUE GOSPEL that they are going to HELL. Then do all I can to help them to understand the LOVE of JESUS for them individually through HIS DEATH on the CROSS. And that JESUS is NOT Coming Back the 2nd Time in Love. HE is coming back Soon Only in JUDGMENT. So when I write I try to present the Gospel creatively. Writing about my faith but always speaking about Jesus LOVE and His JUDGMENT, because the time is short. You cannot present a One Sided Portrait of JESUS to unsaved people! The Apostle Paul warns us to examine our Faith to make sure WE ARE IN THE FAITH. He warned of pastors and others in the END TIMES that would preach ANOTHER GOSPEL leading their flocks to HELL instead of HEAVEN. Plus the world including the Nation of Israel will soon accept the 1st Coming of the FALSE MESSIAH. Why , because they lack discernment of the Word of GOD and cannot discern the Truth from the Coming LIE. So let me remind you that Scripture teaches that their are 3 kinds of Christians: TRUE , CARNAL and PROFESSING CHRISTIANS. The Apostle Paul, not me, calls you to know which you are. JESUS will judge each according to their life here and their words spoken before HIM, one split second after they leave this earth. I care about you. I want you to understand SCRIPTURE. I want you to take your responsibilities and the life you are living out here daily before the eyes of GOD seriously. I want you to begin witnessing to your loved ones and warning them of the events coming and showing them the reality of GODS prophetic words in the Bible. If you truly believe in Christ and you want to not only be part in your NEW FOREVER FAMILY in HEAVEN, but you want desperately to have the rest of your family here on earth with you in Heaven Forever ; THEN START Opening Your Mouth about what is happening all around you, and TAKE YOUR HEAD OUT OF THE SAND. Please know that my prayer for you, is to begin focusing on your RESPONSIBILITIES to JESUS FIRST and not the WORLD, and its CULTURE and ITS HOLIDAYS that surround you. JESUS CALLED YOU TO STAND ALONE FOR HIM ONLY! The Final Holocaust by GOD HIMSELF of ALL Humanity is Coming, do everything you can to witness to those you LOVE ! You have TODAY not Tomorrow ! When I was done studying the latter two emotions took over me. The first was sheer Joy that the God of the universe choose me before I was born; to become His Child and assure me that I would ultimately come home to be forever with HIM in Heaven. I could really do nothing about it but pray. I know… we are called to pray. But phrases kept running through my mind: the few and the many, the narrow road and the wide road, choose life or choose death, heaven or hell, and finally “ONLY the REMNANT”. The word remnant means the few. Too many of the people I care about have already chosen by not choosing; a road to a different place. A place that if given the opportunity to spend but a few minutes in while alive would change their lives here forever. People’s consciences have been seared and calloused. They do not realize how much they now have in common with a frog in a pot on a stove…. an ostrich with its head buried in the sand…. or a deer that runs out into the road and is mesmerized by oncoming headlamps of an approaching vehicle until its too late. Sounds familiar doesn’t it. This is one of the promises of God to those who believe in the coming of His Redeemer, Messiah…His Son Jesus. This promise is to those who have placed their faith in Christ. They will be able to step out in faith, into eternity to live in the Kingdom of God –forever. Do you remember all of the promises? • the lame will leap …. • the dumb will speak praises to the Lamb. • Came to save our sons and daughters! • Came to deliver you! • Calmed a storm with His hand! • Walks where angels trod! Jesus the Son of God, the Ancient of Days, the Great I AM of the Old Testament! These promises and many more belong only to a Spiritually Born Again person. For unless you are Born Again, the physical eyes you see through are spiritually blind. Your physical journey here is like climbing a mountain to get to the top. When you have arrived you will stand before a door. Your focus on your climb will have been so intense that you will not notice the small sign above the door. Then you will eagerly reach out and grasp the handle to open the door to the fulfillment of your desires. The handle is painful to your touch…it’s so very hot ! But you will bear the pain and open the door because you will be consumed with what you heard awaits you. Standing in the open doorway you see a light off in the distance, yet you seem to be standing in shadows. As you look out into the distance a faint path emerges that leads to the light. But as you look down you cannot see the place to put your foot on the path so that you can follow it to the Eternal Kingdom of Light. Then you will look up and see the little sign. It says…“If you had SEEKED ME with all your heart, mind and soul you would have found me. You have lived your life in darkness yet you have seen a great light and now it is appointed to man once to die, and then the judgment”. HIS words fall on a soul filled with shadows and a heart and mind that never became renewed; for you had lived your life deaf, dumb and blind to the truth. “ those who live in Darkness have seen a great light ”. And the words HE wanted you to read will now flood into your mind. The Bible gives us in-sight into the physical world we think is real; and into the invisible world that is true reality. The spiritual dimension is more real than our own existence. The physical realm is ending, but the spiritual realm is forever…. HIDDEN WITHIN A GENEALOGY IN GENESIS 5 ! The Jewish rabbis for centuries have looked into the Bible for prophetic clues that would help them understand God and the coming of the Messiah. Jesus in Luke 24:13 on the Emmaus road did just that. The two disciples were depressed that the Messiah was killed. Hidden within Genesis 5 is the oldest prophecy that God established regarding His eternal plan of redemption for mankind. The Genealogy of names in Genesis 5 is the first place you will find the Gospel, the Good News that we as believers are commanded to preach to our friends, neighbors and loved ones. Every Hebrew letter or number has a meaning. In our Bible we read Hebrew names, but what do they mean in English? When we interpret the meaning of each of these 10 Hebrew names (Adam through Noah), they form the most fascinating sentence in the entire Bible. Adam……………………………man (is), Seth……………………………..appointed, Enosh……………………………mortal, Kenan…………………………sorrow (but), Mahalalel……….The Blessed God, Jared……………………shall come down, Enoch…………………………teaching, Methusaleh……..His Death Shall Bring, Lamech…………….. the despairing, Noah…………………….comfort and rest. How awesome is God, that within the Hebrew names of a genealogy in the Old Testament, He would hide HIS New Testament Plan of Redemption . (Salvation, bought for all through the death of Gods Son, JESUS !). There is no way that a group of Jewish rabbis would conspire to hide the Christian Gospel within their venerated Torah! It’s a gift from GOD, a reward to the diligent “Born Again” student of our Supernaturally Inspired Old and New Testament Scriptures. Remember, History is HIS Story, the story of Christ. That story is hidden in the Jewish Old Testament and Revealed in the Jewish New Testament.